CommonEdits is the brainchild of Matthew S. Lewis, a Texas-based music entrepreneur. The company was founded in 2015, although at that time the innovative streaming service was just a concept. Mr. Lewis knew that in order for people to understand his idea, he needed to present it in a way that enabled others to visualize and interact with it. While CommonEdits had the business model figured out, the vision of what the product should look like was not yet clear. Other music streaming companies had major advantages in the market, and CommonEdits had to differentiate somehow. 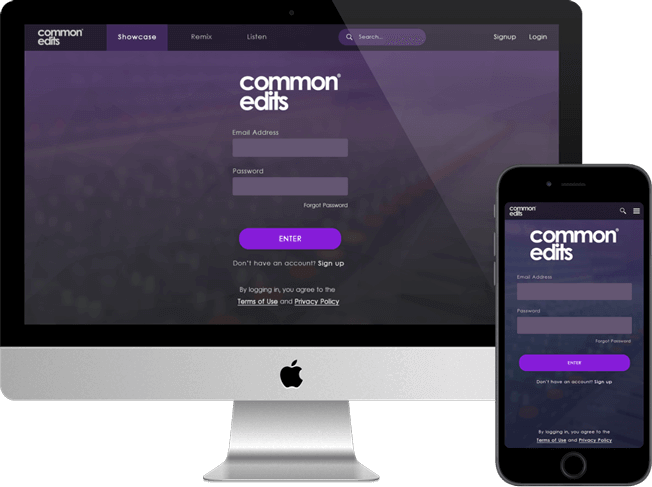 CommonEdits needed a simplistic platform that would also allow local artists to connect and feel like part of a community. After partnering with CommonEdits in February of 2016, Code Authority realized that Mr. Lewis’s idea was truly bigger than anyone could envision. Code Authority then invested wholeheartedly in CommonEdits, not asking for any cash in return — but instead asking to be a small part of this big idea. Code Authority created mockups to illustrate how the product would look and function, with variations for key decision-makers. Code Authority assisted CommonEdits in getting the concept in front of investors, and helped get the idea funded. It’s not about us, or even you. It’s about your users, and that’s why we focus on them. We’ll research them and create an end product tailored to their wants and needs — which should lead to the results you want and need. You’ll have no worries about infrastructure, outsourcing, or quality with our team’s cloud development capabilities. We’re a Microsoft partner with Gold Cloud Platform certification, focused on using the advantages of the cloud to build your software efficiently. Today, your website is the first place that people find you. Make a strong first impression with a professionally designed website developed by our experts. We specialize in Microsoft .NET technologies and can build the easy-to-navigate and visually appealing website you need. We provide you with a dedicated project manager and account service team that will work closely with you on your application — from kickoff meeting to launch — to make sure you’re up-to-date the whole way through...and of course, satisfied with the final result. It may look great, but it also has to work great too. So we make sure that every element of your software is perfect — every link goes to the right place, every image loads properly, and basically every other detail is checked and double-checked. Whatever screen size someone uses to view your mobile application; their experience should be consistent regardless. Making sure that the design looks good and functions properly in every environment — considering all screen sizes, orientations, etc. — is highly important for your users. "His (Jason’s) team is full of rock stars, both literally and figuratively, they provide top quality work. Many software incubators in the startup world shy away from customer facing work but Code Authority does not, they welcome the opportunity to show off their skill set. Can’t thank you guys enough, rock on!"